Prerequisites: high level of fitness, multi-day hiking/trekking experience with 6+ hour days. ↑ Practicing alpine rock anchors in front of Mt. Cook. 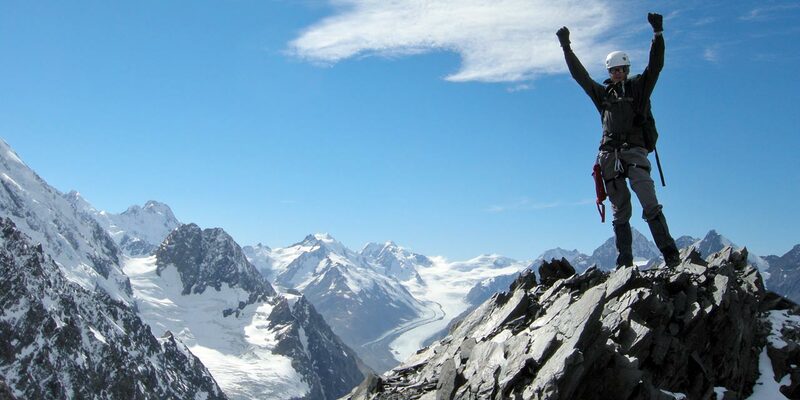 Go beyond the basic skills of mountaineering and get into more serious alpine terrain! This course is an ideal refresher for mountaineers who already have basic snow craft skills and want to take it further. It provides a thorough grounding in all technical alpine skills. Put your skills to the test towards the end of the course with a climb of Turner Peak under your guide's expert supervision. "I knew that this course was going to be challenging for me as I didn't have prior experience in mountaineering but staff at Alpine Recreation made me feel comfortable with choosing the IMS and this was fully backed up in the field by our guide Elke who was totally professional in all aspects of the course. I felt really well supported throughout the week and enjoyed the whole experience. I am looking forward to building on this experience to become more proficient in alpine areas, and look forward to doing another adventure with Alpine Recreation soon." - M. Geyle, Australia. More client comments. The Intensive Mountaineering Skills Course covers a range of mountaineering topics from glacier travel and crevase rescue through to mountain navigation and emergency shelters. Our private Caroline Hut provides an ideal venue for practising the technical skills of mountaineering, and improving your confidence and competence to climb safely in the mountains. Good snow, ice and rock sites are within easy reach from the hut on the Ball Ridge, opposite the mighty Caroline Face of Aoraki Mount Cook. Courses are scheduled from November - April and include an ascent of Turner Peak and snow and ice instruction on the Ball Glacier. Prices start from NZ for private group bookings, NZ for individual bookings. All technical climbing equipment is provided FREE of charge. Returning client discount available. ALL technical climbing equipment - this saves you up to $100 compared with other guiding companies! Meals and accommodation before/after the course are NOT included. 2 participants only - the course will be shortened to 6 days. 1 participant only - the course will be shortened to 5 days and an additional fee of NZ will apply. Alternatively you will have the option to reschedule to another trip/date or a full refund. Due to the shorter length, the course start date will be flexible within the scheduled dates (this allows some flexibility for bad weather without affecting your travel plans too much). With a lower guide:client ratio, you benefit by being able to cover the course content in a shorter amount of time. Our private Intensive Mountaineering Courses are ideal for groups wanting a thorough grounding in technical mountaineering. All levels of experience can be catered for with private groups. A course completion certificate is available on request. ♀ : Exclusive girls-only trip, with female guides. 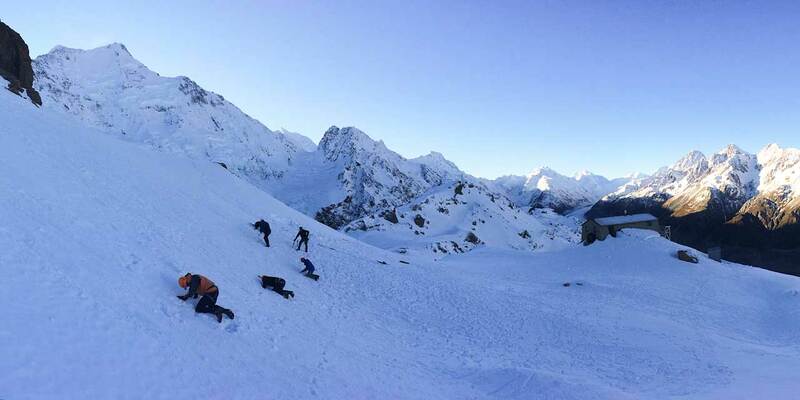 PLEASE NOTE: Due to climate warming and associated loss of snow and ice, late season IMS courses (Mid February to end April) may be held on the upper Tasman Glacier instead of Caroline Hut. Please see Specialized Alpine Climbing Course page for venue details and aircraft prices. 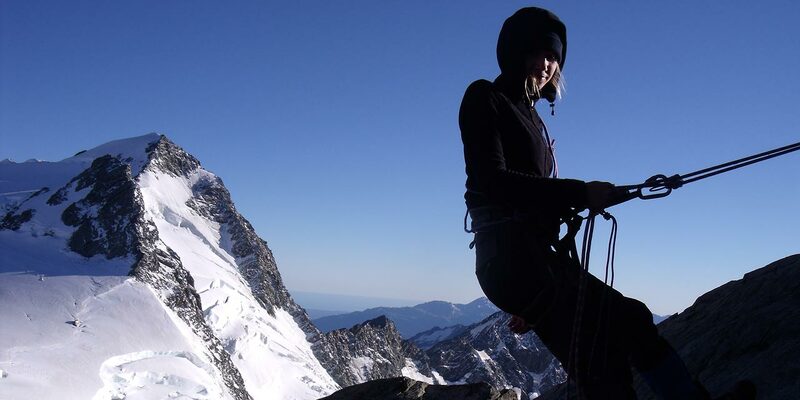 This season we're offering an exclusive girls-only mountaineering course! Join one of New Zealand's select few female IFMGA guides - Elke Braun-Elwert for a fun week of alpine skills. Dates: Look for the ♀ icon in the dates section. This course will take you beyond the basics and will provide you with a thorough grounding in all technical alpine skills. A great refresher for those with previous mountaineering experience and a good preparation for technical ascents. Summer courses are scheduled from November - April and include an ascent of Turner Peak, with snow and ice instruction on the Ball Glacier. 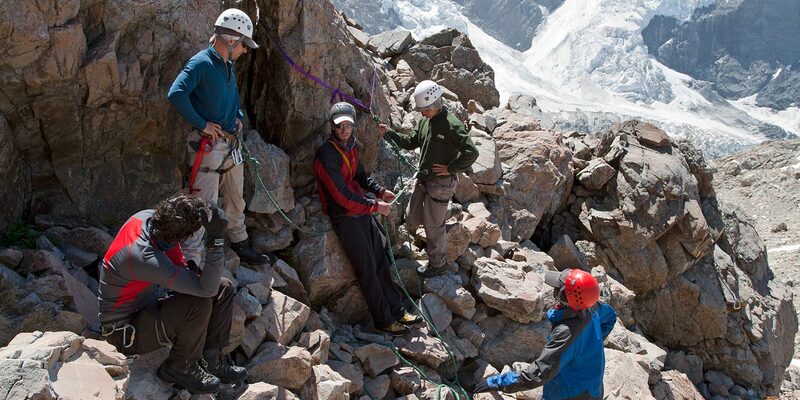 The Intensive Mountaineering Skills Course is intended to provide a thorough grounding in technical mountaineering. Want to take it further? Follow it up with our Specialized Alpine Climbing Course. If you are after a mountain experience course and are not necessarily intending to become a serious alpine climber, we recommend the Introductory Mountaineering Course. The course will be tailored according to the needs of participants and the weather, snow and ice conditions at the time. In November-December when there is still lots of snow cover, crevasses will be filled in and there will be very little exposed ice or rock. January-April, when snow has melted back, good alpine rock and ice climbing is more readily available. For climbers who already have considerable rock experience the focus will be on snow and ice skills. Weather permitting, participants will have the option to spend a night or two in an open bivvy. We provide extra equipment such as a cooker, bivvy bags, sleeping mats, etc. at Caroline Hut. Kaitiaki Peak 2222m/7290ft, Turner Peak 2341m/7680 ft.
Caroline Hut makes a good classroom as it is warm and cosy and well equipped with instruction material - there is still much that can be covered on a hut day and your guide will keep you busy. 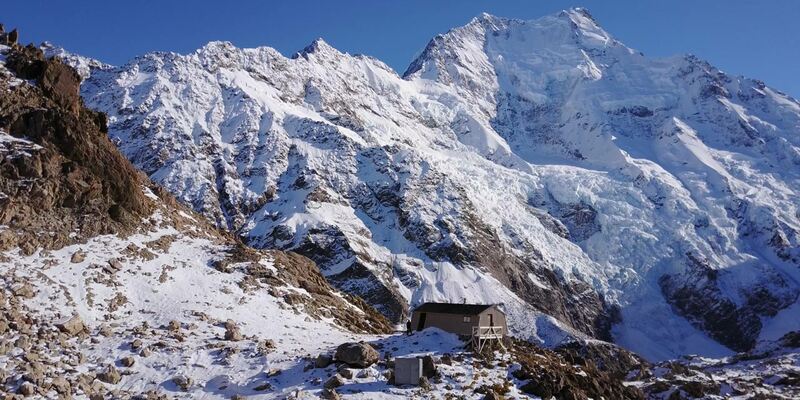 ↑ Caroline Hut is an ideal venue for mountaineering instruction courses. Caroline Hut is the only guide/operator-owned mountain hut in Aoraki Mount Cook National Park and is available for the exclusive use of Alpine Recreation parties. It provides a high standard facility for professional instruction. No aircraft required: the hut can be reached in 4-6 hours' walking from the road end and can be accessed in most weather conditions, maximizing time spent in the mountains. Private facilities: uncrowded, clean and with a guaranteed bunk. Spend more time learning skills than managing your camp! Comprehensive climbing equipment and instruction aids at the hut enhance the quality of instruction. This includes a solar-powered iPad which can be used to complement field instruction. Great location: Caroline Hut sits at 1820m on Ball Ridge, directly opposite the stunning Caroline Face of Aoraki Mount Cook, with ready access to alpine rock, snow & ice sites. Fully equipped with firewood, gas, solar lighting, satellite phone, Department of Conservation radio, sleeping bags and nonperishable food. A wood-fired stove provides good heating and drying facilities. A high level of fitness and extensive hiking, tramping or trekking experience is required. Basic mountaineering skills and experience are preferable, but not essential. The IMS spans 7 full days, starting 8am on the first day and finishing 5-6pm on the last day. This allows plenty of time for covering all the technical skills you'll expect from this level course as well as time to enjoy the new terrain and spectacular scenery. 8am on the first day. Meeting point is at Alpine Recreation's Edelweiss Lodge, 8 Erebus Place, Lake Tekapo. If you have requested a pick-up from your accommodation, please be ready for pick-up at 7:50am. You'll meet your guide and once everyone in the group has arrived, your equipment will be checked. Any items of equipment that you have been unable to provide yourself will be provided free-of-charge. Good leather climbing boots are available if you do not have your own. 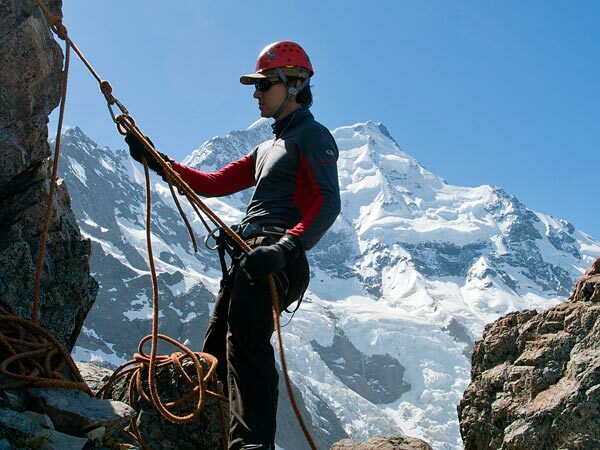 All technical mountaineering equipment is provided (helmets, harnesses, slings, carabiners, rope etc.) but you are welcome to bring your own if you have them. Drive to Mount Cook (about 1 hour), transfer to 4WD vehicle and drive as far as possible up the old Ball Hut Road, parallel to the Tasman Glacier. The effects of glacial recession are very evident as we hike beside the lateral moraine. From the Ball Shelter site you climb 850m/2800ft up the Ball Ridge to Caroline Hut at 1800m/6000ft, perched right opposite New Zealand's highest ice face, the Caroline Face of Mount Cook. As the hut is fully stocked we only need to carry some fresh items of food (e.g. bread, fruit, vegetables, meat) and our personal clothing and equipment. After reaching the hut there may still be time to practise some knots. Snow and ice instruction on the Ball Glacier or near Ball Pass. For rock climbing and abseiling practice there is good quality sandstone on Ball Ridge near Caroline Hut. Practise various kinds of belays and anchors, and how to select a good route. Good cramponing techniques are emphasized, likewise knowing different methods of self-arresting and choosing the right methods for the conditions. You can be lowered into a crevasse and climb out again, practising steep ice climbing with front-pointing. Weather assessment will become second-nature. For climbers who already have considerable rock experience the focus will be on snow and ice skills. On a clear night, the group may opt for an open bivvy - a good chance to learn how to manage setting up camp and sleeping under the stars. Additional equipment for this option is provided at Caroline Hut. When your guide thinks you are ready for it, you will climb Turner Peak - a good test of your technical skills. The return to Mount Cook village via the Tasman Valley is quite quick, allowing most of the day to be spent doing some multi-pitch rock climbing at Sebastapol Bluffs. There is a good choice of longer or shorter routes, which the guide will assist in selecting, according to the skill level you have reached. Return to Lake Tekapo, arriving at 5-6pm. Those electing to continue with our Specialized Alpine Climbing Course can stay overnight at Unwin Hut (NZAC) at Mt. Cook (own cost), or return with the guide to Tekapo. Continue onto our Specialized Alpine Climbing Course (SAC) to extend yourself with more technical climbing. Our low guide-client ratio on these courses allows you to push things further and may even include a climb of a 3000m peak! → Intensive Mountaineering Skills Course Clothing & Equipment list. 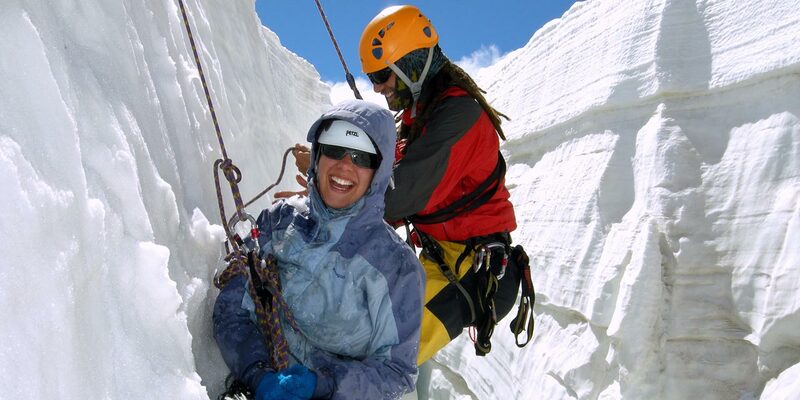 Answers to common questions about the Intensive Mountaineering Skills Course are listed here. Please see our Climbing FAQ's page for anything not specifically related to this course.